I would love to know who the brilliant marketing mind was who first came up with the idea of slapping a personal possessive adjective on the name of a fragrance to create a new flanker name. It really is nonsensical, if you think about it. 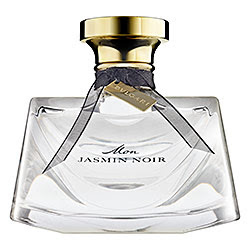 So if Mon Jasmin Noir belongs to me, to whom does my bottle of Jasmin Noir belong? To you, perhaps? In this particular case, the name is doubly illogical, because there is not a drop of noir anywhere to be sniffed in Mon Jasmin Noir. The licorice of the namesake has been replaced by lily of the valley (white) and the almonds have been replaced by musk (clear). Even the bottle of this flanker is transparent. They appear to have changed the shape of the bottle in order to distinguish it from (the now discontinued?) Voile de Jasmin—launched way back in 2006—this house's Nivea lotion-esque jasmine perfume (not sweet). According to my nose, Mon Jasmin Noir falls into the recently created category of sweet laundry scents, with a fairly big dose of jasmine and a vaguely Cacharel Eden-esque quasi-polymeric (synthetic) quality in the drydown. There is also a touch of light woods. All in all, a completely different perfume from its namesake. Jasmine is the common denominator, but here it is much more musky (albeit sweet) than oriental. I prefer the original. My initial encounter with Jasmin Noir was a surprising one. 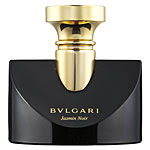 I had purchased the perfume scent unsniffed on the strength only of my love of Bvlgari pour femme. I'm not sure what I was expecting, something perhaps more serious, more intense, but my first spritz seemed like a shower of sugar. After that, there was a strange mélange of je ne sais quoi. I honestly couldn't figure it out. Later, a long-lasting light layer of black licorice was left behind. I liked it, but I love black licorice. Licorice root is one of the sweetest substances around, though it has no sugar or calories, which is why licorice root tea is as satisfying as dessert. Interestingly enough, in subsequent wearings, Jasmin Noir expressed itself very differently on my skin depending on all sorts of factors: temperature, humidity, blood caffeine and sugar content, planetary motion—who knows what else? What I have found is that my perception of this perfume changes a lot depending on any number of things. Sometimes the jasmine seems dominant; at other times, I smell primarily licorice and/or almonds. What I can confidently assert, however, is that never have I disliked Jasmin Noir. Whichever notes may be standing out on a particular day, I always find the overall effect of this perfume to be smooth and seductive. Adding to the overall appeal, the bottle is beautiful and deceptively opaque—the smoky glass reveals its true nature only juxtaposed to bright light (or snow). I like how the bottle thus aesthetically reflects the mercurial nature of the perfume inside. I recommend this fragrance to those who like pleasant, slightly sweet, mildly floral, completely nonaldehydic, non-soapy fragrances. Needless to say, this is nothing like the new flanker nor Bvlgari pour femme nor any other perfume I've tried from this house. But it's really quite nice, provided that you happen to like black licorice, which is bound to be salient some of the time! Salient notes (from fragrantica.com): green plant juice, gardenia flowers, Sambac jasmine, sateen (??? ) almond aromas, precious wood, liquorice absolute, and tonka. 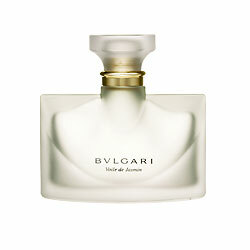 This Bvlgari offering opens with a lovely sweet violet-like iris mingling delicately with mimosa. Gorgeous! Had I tested this creation in a store, in all likelihood I would have snapped up a bottle, as the opening lasts just long enough to seal the deal. Unfortunately, a few minutes later, Voile de Jasmin begins to morph into a progressively less floral fragrance, which dead ends in a Nivea-Ivory soap amalgam drydown with such extraordinary longevity that it effectively nullifies the beauty of the opening. The drydown so thoroughly dominates my overall experience of this perfume that the enticing opening is entirely eclipsed by, let us call it, the Nivea effect. Not that I have anything against Nivea, mind you—I've used it for many years. But it is what it is, and it's not what it's not: perfume. Some reviewers have complained of the fleeting nature of this fragrance, and my best guess is that they use either Nivea or Ivory and are unaware that Voile de Jasmin is contributing significantly to that just-washed and lotioned smell. Even taking into consideration the fleeting opening, I must say that I still do find the name of this fragrance rather misleading. "Veil of jasmine" suggests the promise of, well, jasmine! Perhaps the name should have been "Jasmin voilé" or "jasmine veiled (hidden)". But honestly, the jasmine is so well hidden in this composition that the veil is more like a burkha! Based on the long list of my former loves which have been discontinued, I gather that my own idiosyncratic impressions often diverge rather radically from marketing data. However, in this case, there may have been some overlap, assuming that Voile de Jasmin has in fact been discontinued... Although I was unable to locate this perfume at the house's website, it is definitely still available at discount emporia, so if you happen to be looking for a Nivea-Ivory facsimile perfume, you're in luck!